JUNEAU — An old bell tower with a new frame has been returned to its original location atop a historic Russian church in downtown Juneau. The 609-pound bronze and iron cast bell, which was built in Saint Petersburg, Russia sometime in the 1850s, was tolled 12 times Saturday morning once in its rightful place. The belfry was removed from above the narthex, which is the entryway into the main octogan-shaped church, in 2007. The narthex’s roof was unable to support the bell’s weight due to severe deterioration from the wet climate. The deterioration was discovered at that time as the main building was being re-roofed. The bell tower has since remained on blocks in the chapel yard directly behind the church on Fifth Street. To make the narthex structurally sound, construction workers made a new tower stand for the tower, but this time they attached it to the roof. It’s a stainless steel frame, but is painted white to match the church’s decor. “When they took it out it was just rotted, especially where the wall comes up to the ceiling because that was where the rain had been just coming in for years,” Dauenhauer said. The bell tower itself was insulated and weather-proofed. The tip of the tower was also outfitted with a new white cross. The work was done by Alaska Commercial Contractors, Inc., in Juneau after they were awarded a bid for the project in December 2011. Contractor Jason Murdoch said they began the construction this September after waiting on bell parts from the Lower 48. St. Nicholas obtained funding for the project through local, state and federal funding. A nonprofit secular group that specializes in restoring Russian churches, Russian Orthodox Sacred Sites in Alaska (ROSSIA), procured a $50,000 grant for the project from the state Legislature in 2010. Former governor Sarah Palin vetoed funding for the preservation efforts when she was in office, but Juneau legislator Rep. Beth Kertulla helped obtain the grant later on, said ROSSIA board member and volunteer Rebecca Shaffer. ROSSIA in this case acted as a middleman in obtaining money from the government since government officials are generally wary of giving money directly to churches due to separation of church and state concerns. ROSSIA receives letters quarterly from churches asking for help. 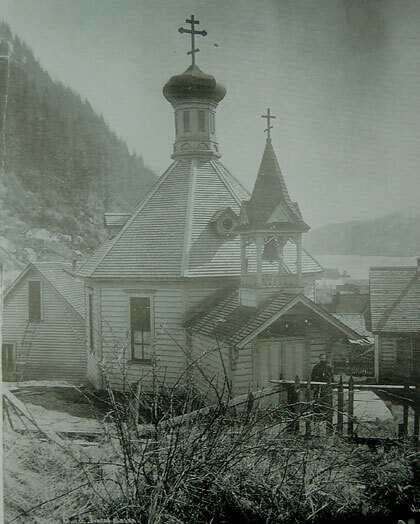 The story of St. Nicholas, one of 36 Russian churches in Alaska on the National Register of Historic Places, particularly resonated with the group, according to Shaffer. Other donations to restore the belfry flowed in from the community through an fundraising group called Friends of St. Nicholas. That group raised money to re-roof the main building in 2007, but $6,000 was left over and went to this project. Shaffer called this moment a historic milestone for the church in terms of its restoration, but noted there is still much work to be done. The next project is to place a foundation under the building because the whole church is up on blocks since it was built without a foundation. “This is a great milestone, but it’s just part of the process that all these buildings need — care over time,” Shaffer said. The wood church required renovations in the 1970s and 1980s when the gold dome with a cross on top of the main building was rotting. St. Nicholas is locally known for reaching out to Native peoples during the Gold Rush in the 1880s and using Native language in worship despite missionaries being instructed not to. As a result, many Tlingit people embraced the religion and were eager to develop a parish. About 700 of 1,500 local Natives were blessed by Bishop Nikolai in July 1892. By the next year, the parish raised enough money to begin construction, which began in July 1893 and was completed that November. It was consecrated in June 1894 by Bishop Nikolai. The church is also famous for being one of the last of the Orthodox churches with an octagon shape. It houses a seven-bay iconostasis inside. The bell itself was donated to the church in 1905 by the people of Saint Paul Island, situated in the Bering Sea between Russia and Alaska. The bell is decorated with three icons: Christ Pantocrator, Our Lady of Tikhvin and St. Nicholas of Mrya. Father Wozniak, who blessed and tolled the bell around 10 a.m., said it was wonderful to see the bell back where it belongs.